Only The Fire Can Say considers inheritance - of memory, people, places, objects and ideas we grow with - that become part of our personal living history. Betrayal, regret, forgiveness? Peter’s denial of Christ is one of the most compelling human stories of Christianity, and Lasso's monumental valediction, Lagrime di San Pietro (The Tears of St. Peter) is the supreme musical re-telling of this pivotal moment in biblical history. 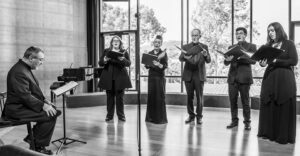 Allegri’s justly famous Miserere is one of the most beautiful of all choral works and this iconic cry for mercy and forgiveness features the soaring splendour of soprano Greta Bradman.